Sleeping Beauty is the latest re-imagining of a ballet classic by choreographer Matthew Bourne. The award-winning production aired on Great Performances, Friday, April 25 at 9 p.m. on PBS, after a triumphant premiere in London in 2012 and a U.S. tour in the fall of 2013. (Check local listings). With Sleeping Beauty the British choreographer has returned to the music of Peter Ilyich Tchaikovsky to complete the trio of the Russian composer’s ballet masterworks. Bourne began in 1992 with Nutcracker! and, most famously, in 1995, with the international hit Swan Lake. The timeless fairy tale about a young girl cursed to sleep for 100 years was written by Charles Perrault in 1697. Tchaikovsky and choreographer Marius Petipa used the story in 1890 to create what has became a legendary ballet. Bourne takes 1890 as his starting point, setting the christening of Aurora, the story’s heroine, in the year of the ballet’s first performance: the height of the fin-de-siecle period when fairies, vampires and decadent opulence fed the gothic imagination. As Aurora grows into a young woman (Hannah Vassallo), time moves forward to the more rigid, uptight Edwardian era; a mythical golden age of long summer afternoons, croquet on the lawn and new dance crazes. Years later, awakening from her century-long slumber, Aurora finds herself in the modern day; a world more mysterious and wonderful than any fairy story. 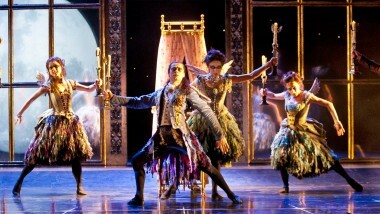 Matthew Bourne’s haunting new scenario is a gothic fairy tale for all ages. The traditional tale of good vs. evil and rebirth is turned upside-down, creating a supernatural love story, across the decades. Danny Collins, Pia Driver, Phil Jack Gardner, Tom Jackson Greaves, Nicole Kabera, Kate Lyons, Leon Moran, Luke Murphy, Ashley Shaw, Danny Reubens, Chris Trenfield. Bourne – dubbed “the most popular choreographer of theatrical dance in the Western World” by The New Yorker — works again with three of his regular collaborators, and New Adventures Associate Artists: the Tony and Olivier award winning designers, Lez Brotherston (set and costumes), Paule Constable (lighting) and Paul Groothuis (sound). Matthew Bourne’s Sleeping Beauty is a Leopard Films/Argonon Production for BBC and THIRTEEN Productions LLC for WNET with the assistance of The Australian Broadcasting Corporation. It was directed for television by Ross MacGibbon. Conductor: Brett Morris. Managing Director of New Adventures: Robert Noble. Executive Producer for BBC: Greg Sanderson. Executive Producer for Leopard Films: Todd Austin. Producer: Fiona Morris. For Great Performances, Joan Hershey and John Walker are producers; Bill O’Donnell is series producer; David Horn is executive producer. Great Performances is funded by the Anne Ray Charitable Trust, the Irene Diamond Fund, the Anna-Maria and Stephen Kellen Arts Fund, The LuEsther T. Mertz Charitable Trust, Rosalind P. Walter, The Agnes Varis Trust, The Starr Foundation, the Philip and Janice Levin Foundation, The Lewis “Sonny” Turner Fund for Dance, and PBS.